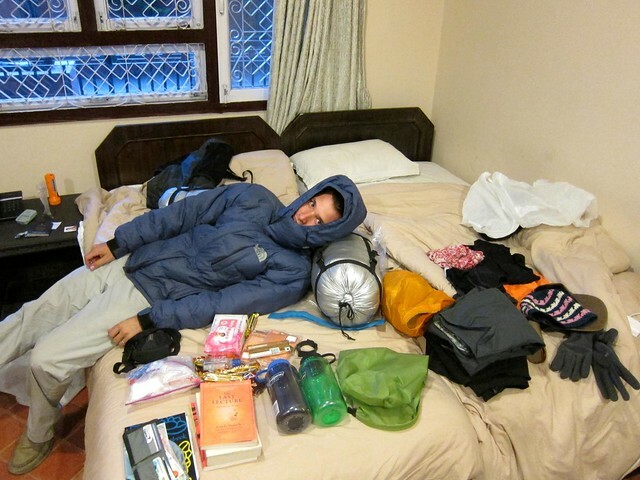 Everest Base Camp Trek: Day 0, getting prepared… – snackettes. Though I’d always dreamed of seeing Mt. Everest one day, the idea of actually doing it only started churning in my head the day I met Annie, a pediatrician who I met at Angkor Hospital for Children in Cambodia, while we were both volunteering at the hospital. Annie, her husband, and her two kids had taken a year off from their lives in California to travel around the world together. Listening to Annie’s stories of Italy and Africa and Turkey, I found myself a little envious of what they were doing, and I had to pinch my arm to remind myself that I was in fact doing a similar thing. (Funny how that happens.) I think the feeling of envy I had only resulted from the fact that they were taking a year off with their middle school-aged kids in tote, which for me, took it to a whole new level (and is something that I dream of doing one day as well). I had read stories about families who had done similar things but had never met anyone who had really done it. Annie and I were taking a Cambodian language class together, and before every class I would bombard her with questions about their travels over the past few months. I loved listening to her stories of maneuvering her family across the globe, through the slums of Mumbai to an organic farm in Thailand. One of the memories that Annie gushed on about the most was the day her family caught their first glimpse of Mount Everest. She could barely put it into words. RIght there, I made my decision: I was going to see Everest too. Growing up, I never knew it was possible to hike to the base of Mt. Everest if you don’t plan on climbing the whole darn thing; I imagined the tallest mountain in the world being in some snowy, inaccessible area of Nepal, closed off to all but the most serious mountain climbers. Well, Everest is indeed in an extremely snowy, inaccessible area of Nepal, but it turns out that the trek to the mountain’s base is one attempted by thousands of people every year. And some of them actually make it – as long as they’re willing to walk for 14 days at elevations of over 17,000 feet. It was going to be one of the most challenging things Scott and I had ever attempted, but we were willing to try. I began reading up on the logistics of getting to Mt. Everest through some websites (WikiTravel…) and found that what Annie and her family had done was a shorter, four-day roundtrip hike to the first viewing point of Everest, still 25 miles away from the mountain itself. Her family didn’t have a lot of time in Nepal, so they had turned around at that viewing point and headed back down to the trailhead. However, I learned that many people choose to keep hiking over the course of ten or eleven days to reach the base of Everest itself, where “Everest Base Camp” (EBC) is located. I could barely contain my excitement; EBC is where people intending to climb to the summit camp out for weeks (months?) as they acclimatize and wait for their summit push. For years, I had been fascinated with stories of people climbing Everest, reading books and watching documentaries on the subject (including having a near-religious devotion to the Discovery series “Everest: Beyond the Summit”, which follows the famed basecamp manager Russell Brice as he attempts to get hikers onto the summit). 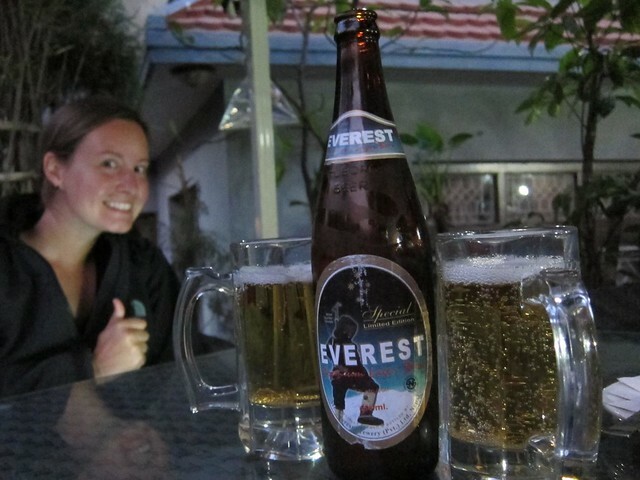 When we arrived in Kathmandu, we had one (ONE!) free day before our flight to the trailhead of the EBC trek. Almost everything that we would need on our two-week unassisted trip would have to be bought in Kathamandu, since the provisions available after starting the trek were said to be either extremely limited or extremely expensive (bad time to get a blister or find that you forgot your toothpaste!). Because we had been traveling in hot-weather climates for the past 6 months, we had no cold-weather clothing or gear with us, and we needed to acquire everything that we would need to help us survive a two-week trek in freezing temperatures – in a single day. 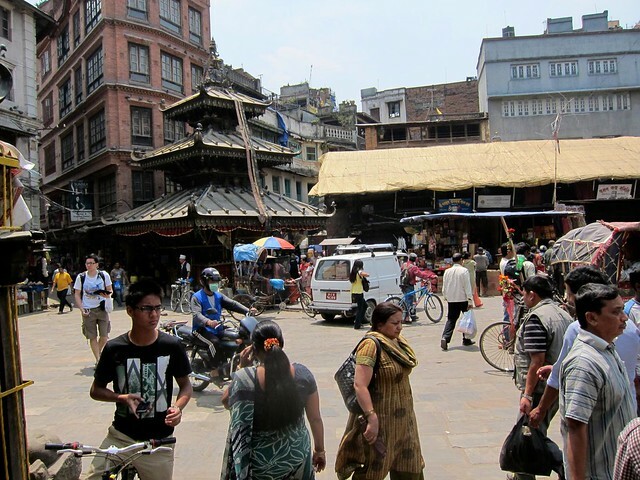 Kathmandu was a city of contrasts, where ancient Tibetan tea pots and singing bowls sat alongside state-of-the art hiking boots and Gor-Tex snow jackets. The section of Kathmandu geared towards trekking tourism was a little hiking village of sorts, where every storefront sold some type of equipment that you might need to get you to the top of Mt. Everest or to any of the other big-time mountain ranges in the area (Annapurna, Lhotse..). 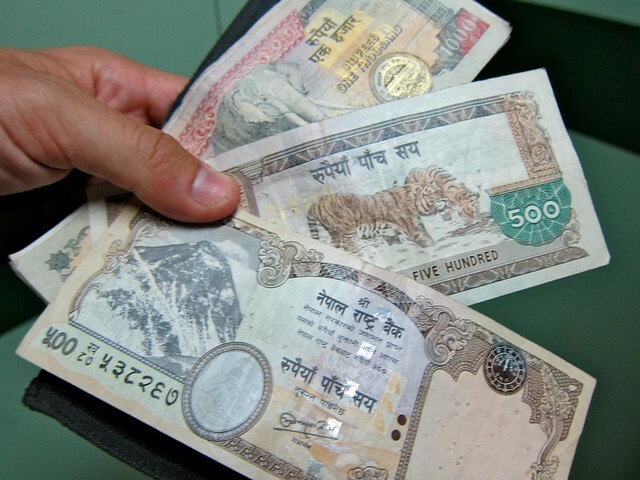 Getting enough money to bring with us on the trek was a strategic nightmare. 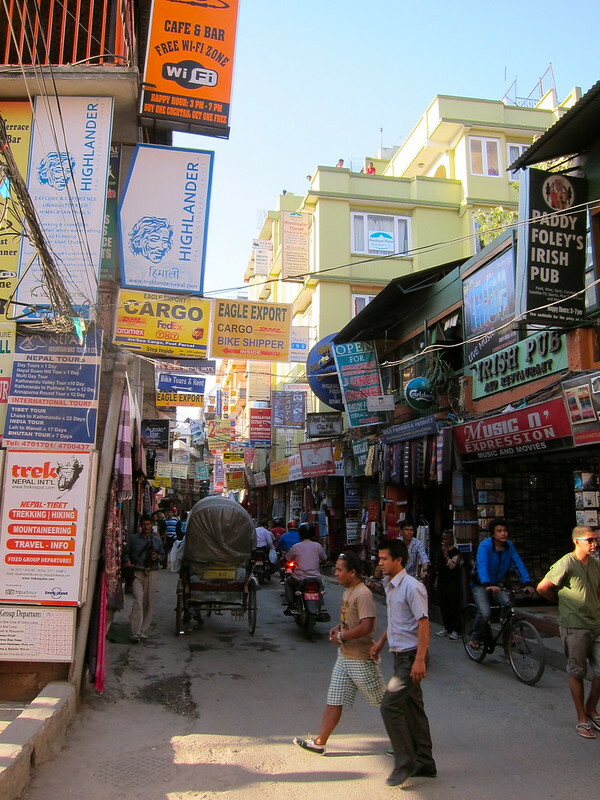 We would need to carry all of the money that we needed for two weeks, and we also needed cash to buy all of our gear in Kathmandu. However, we didn’t know how much housing or food would cost up on the trail, and our ATM cards had a strict daily limit. Earlier in the day, we had stupidly paid for our round-trip plane tickets to Lukla with our cash reserves (rather than just using a credit card and paying an extra fee), which cost a total of about $500 for two people. After trying multiple ATM machines around town to find one that would take our card, we finally found one and pulled the largest sums we could until we hit our card’s daily limit– rats! Then we waited 24 hours (right around the time we needed to be heading to sleep) and pulled the limit again. We were going to be hitting the trail with that fixed amount (about $800 USD), and it needed to last for two weeks of food, accommodations, and anything unexpected…. That night, we packed in the dark by the light of our flashlights; Kathmandu is infamous for cutting off its residents’ electricity for up to 16 hours a day, in order to ration it to different areas of the overloaded city. 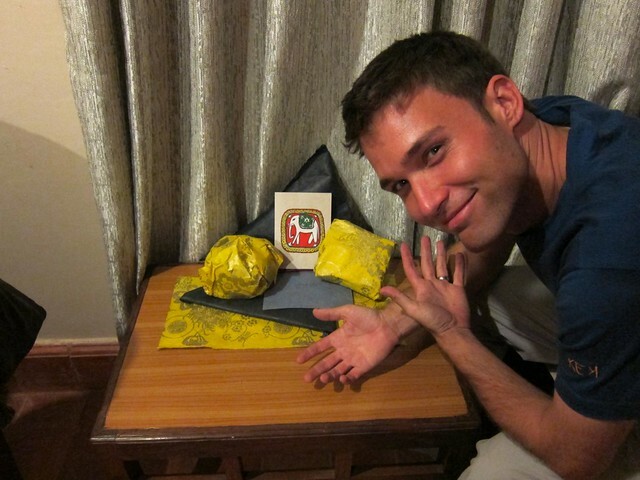 We managed to fit it a quick, early celebration of my upcoming 29th birthday (which we would be celebrating on the EBC trail), and then we fell into bed far too late, totally exhausted, and tried to get some sleep before the nerve-wracking flight that lay ahead…. Hi Many thanks for the informative blog, me and my travel mates who are going in May next year found the info very useful! It is such a joy reading your blog, light hearted and good pics!